Infinite Pro Wrestling Presents: Homecoming! Saturday afternoon May 11th, Infinite Pro Wrestling will debut in Weirton, WV as IPW brings you Homecoming! This will be our earliest event ever, but the action will still be the same as you expect from IPW. Doors will open at 4:30 pm with a bell time of 5:00 pm! Tickets go on sale on our website at midnight 4/15/2019! Our CEO, David Scherich embarked on his Air Force career in 1997, and after putting in almost 21 years in the Air Force, David wanted to bring some entertainment back to his home area. We are proud to be able to come to Weirton to put on a great show and introduce the great people of the Weirton, WV area to Infinite Pro Wrestling. Infinite Pro Wrestling Presents: Aftershock! What a Rush! Harrington Delaware we are back 4/13! Ohhh What a...RUSH! Featuring WWE Hall of Famer Road Warrior Animal! The event will be at the Harrington Fire Hall. Tickets on sale 3/1 at Infiniteprowrestling.com! Not in Delaware, go to IPWTV.com for the iPPV. Get your tickets online before they sell out. There is no guarantee of any seats the day of the show. 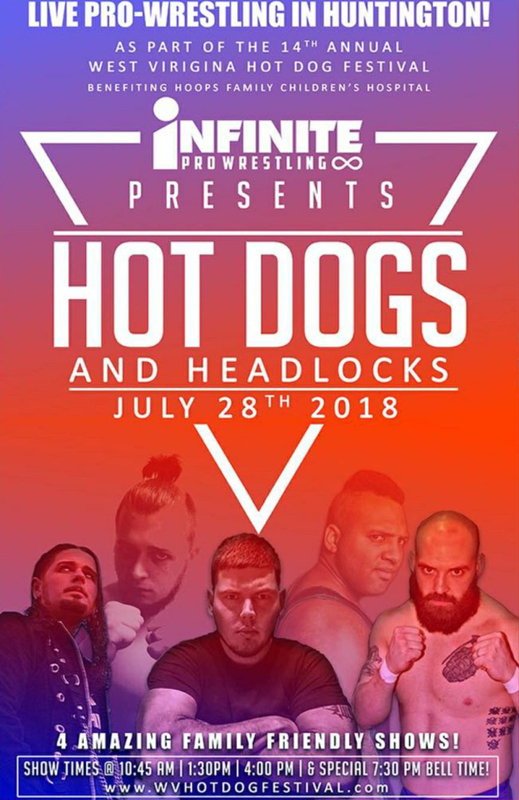 Tickets are NOT available at the Harrington Fire Hall. Event subject to blackout in host state and surrounding areas. Infinite Pro Wrestling Presents: Rise Up! IPW Presents: Rise Up! Coming live from the Dodge Recreation Center in Columbus, Ohio! Bell time is 7 pm, doors open at 6:30 pm. Tickets start at just $10! Tickets on sale now, head over to our ticket page. Infinite Pro Wrestling Presents: Heartbreak! Infinite Pro Wrestling Presents: Fractured! On Saturday, November 17, 2018, Infinite Pro Wrestling will end the year by returning to Ohio with Fractured! This event will take place at the Dodge Recreation Center in Columbus. This event will feature former WWE Superstar Simon Gotch! This night will be an action-packed as you would expect from Infinite Pro Wrestling. More announcements soon regarding this event! Tickets available soon! Infinite Pro Wrestling returns to Delaware on Saturday night, September 15, at the Dover YMCA. Impact star Brian Cage will make his IPW debut! This will not be the only debut on this show! Stay tuned for announcements! Huntington, WV! First show starts at 10:45 am! Infinite Pro Wrestling Presents: Tag Wars! Saturday night July 7, 2018 at the Chesapeake Community Center in Chesapeake, Ohio. Doors open at 6:30 pm and bell time is 7:00 pm. Concessions will be available. Card subject to change. All sales are final. All rights reserved 302 Pro Wrestling, L.L.C.